Preheat oven to 350-F (175-C) degrees. Prepare baking sheets with baking parchment paper (makes for real easy clean-up!) In the bowl of a food processor or one of those expensive standing mixers (sure wish I had one) blend together 2 cups brown sugar, 2 cups canned or roasted pumpkin, 1 cup vegetable oil, and 2 teaspoons vanilla. Now the original says to sift together the dry ingredients then to add to the wet mixture... but I'm a lazy cook and I've never had a problem with just adding each ingredient and mixing a little with my mixer/food processor. So, add in 4 cups all-purpose flour, 2 teaspoons baking soda, 2 teaspoons baking powder, 2 teaspoons cinnamon, 1 teaspoon nutmeg, and 1/2 teaspoon ginger. Mix well. Last add in chopped up dark chocolate or milk chocolate candy bar. Or use chocolate chips - white or dark, whatever. you choose - because you're gonna eat them. Use as much or as little as you like. Omit the chocolate if you will. I think I used about 100 grams worth of milk chocolate. 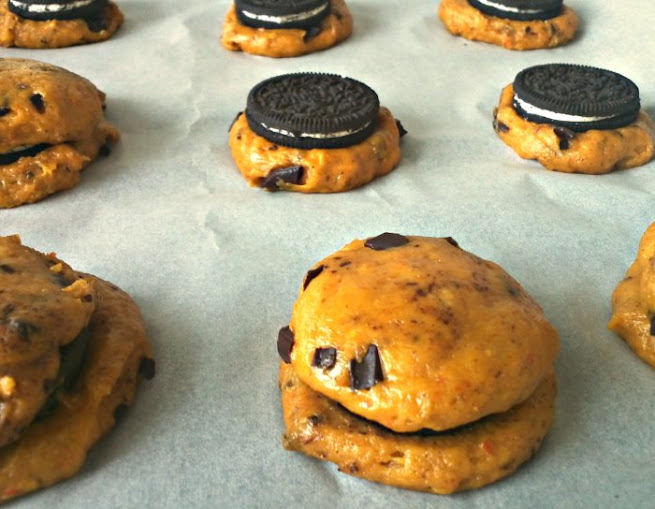 Now, the batter is a firm enough to handle dough so you can just spoon it out on the the cookie sheet as is, or you can press an Oreo cookie into the batter or between two pieces of cookie dough. 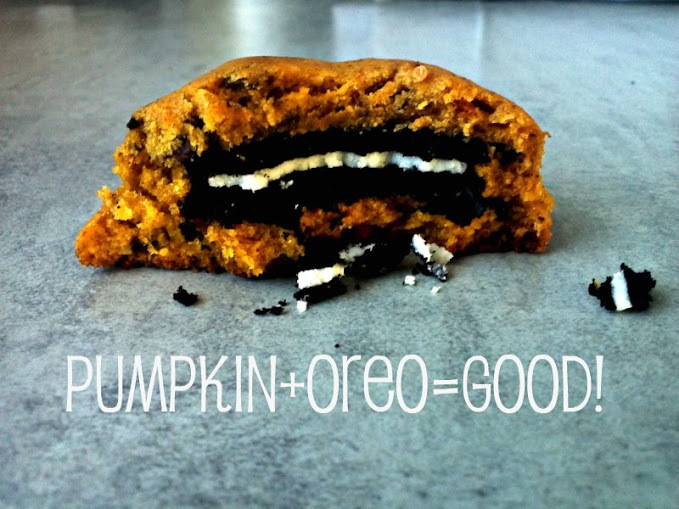 These would even make nice muffins - so you could stick an Oreo into the bottom of a cupcake/muffin tin and then spoon the batter on top and bake accordingly. Be creative!